Some of us living in the Northern Hemisphere will be able to view a solar eclipse on Friday 20 March 2015. Most people will only see a partial eclipse, but some lucky people living in a particular region will experience a total eclipse. When this happens the Sun is completely obscured and it goes dark during the period of time that the Sun is covered. Throughout this post I will use the term “eclipse” to mean an eclipse of the Sun or solar eclipse. I will talk about eclipses of the Moon in a future post. As you can see from the map, most of this area is uninhabited, with the notable exception of the Faroe Islands (population 50,000) where a total eclipse lasting over 2 and half minutes will be visible. This will give a temporary boost to the islands’ tourist industry as many ‘eclipse chasers’ will be travelling from all over the world to get the best possible view. Most of Europe, northern Africa, the Middle East and northwestern Asia will only see a partial eclipse. The closer a point is to the path of totality the more of the Sun will be covered. This led our local newspaper to say, rather dramatically, that we will be plunged into darkness (Ref 2). This isn’t true, as the difference in daylight between the normal sunlight and at the peak of the eclipse will be only slightly noticeable to the human eye. Unfortunately the eclipse will not be visible from anywhere in the North American mainland as it will be night time there when it occurs. However, on 21 August 2017 there will be a total eclipse which can seen in North America (Ref 3). Why do we have eclipses? It is fairly common knowledge that solar eclipses occur when the moon passes in front of the Sun obscuring some or all of its light. This is shown in the diagram below, although the distances and sizes of the Earth, Moon and Sun aren’t to scale. 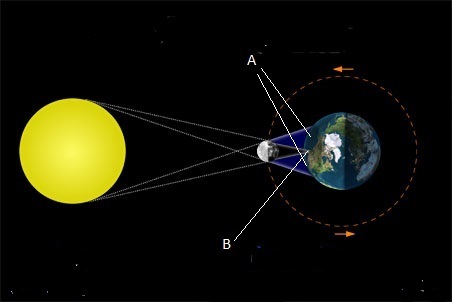 In the diagram above, the regions labelled A see a partial eclipse. Only in the small region labelled B does the Moon fully obscure the Sun and a total eclipse is seen. However, this picture only shows a two dimensional view. The Moon’s obit around the Earth is actually tilted at about five degrees with respect to the Earth’s orbit around the Sun, as shown in the diagram below. This means that during most lunar months the Moon passes just below or just above the Sun rather than obscuring it. There are only two time windows in a year when a total eclipse can occur (see notes). The moon is roughly 400 times smaller in diameter than the Sun, but by a strange coincidence is also roughly 400 times closer to the Earth than the Sun. This means that, when viewed from the Earth, the Sun and the Moon appear to be almost exactly the same size. If the Moon were closer to the Earth or larger in size then solar eclipses would be more frequent and would last longer. 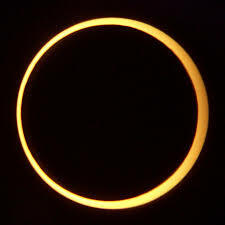 If the Moon were further away or smaller then we would only have what is called an annular eclipse where the disc of the Moon is too small to fully cover the Sun. The Moon, rather than moving in a circular orbit, moves in an elliptical (oval-shaped) orbit around the Earth. This means that its apparent size as seen from Earth varies. 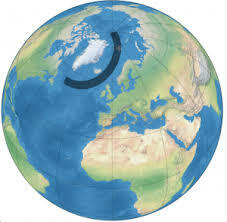 It is obviously at its largest when it is closest to the Earth and smallest when it is furthest away. The apparent sizes of large objects in the sky are measured in degrees. 1 degree is roughly how big a British 1 pence or US 1 cent coin would appear to be if you held it up at a distance of approximately 1.2 metres (4 feet) away from your eye. When it is at its closest, the Moon is 0.558 degrees in diameter and at its furthest away it is 0.491 degrees in diameter. The Earth also moves in a elliptical orbit around the Sun. So the apparent size of the Sun varies as seen from the Earth, but the variation is not as a great as the apparent variation in the size of the Moon. When the Earth is at its closest to the Sun, the Sun is 0.545 degrees in diameter and when the Earth is at its furthest away the Sun is 0.526 degrees is diameter. This variation means that there are times when the Moon lies directly in front of Sun, but, because it appears to be slightly smaller, we only see an annular eclipse. How long can a total eclipse last? The Moon should be as close to the Earth as possible making its apparent size as large as possible. The Earth should be as far as possible from the Sun making the Sun’s apparent size as small as possible. Another much less important factor is that the eclipse should occur at a point on the Earth when the Sun and thus the Moon are directly overhead. This gives an additional but very small boost to the apparent size of the Moon relative to the Sun. This diagram, which is greatly exaggerated, shows that when the Moon is directly overhead (A) it is very slightly closer to the Earth then when it is at the horizon(B). This causes the moon be slightly (1.8%) larger in diameter. All of these conditions will be achieved for an eclipse which is predicted to be happen in South America near the equator on 16 July 2186 and will be 7 and half minutes at its greatest duration (Ref 3). I will not be around to see it, and neither will you! As those of you who have read my previous post “The Days are Getting Longer” will recall, the Moon is gradually gettting further away from the Earth at a rate of about 4 cm per year. If we go back in time to just after the Moon was first formed, about 4.5 billion years ago, it was around 22 500 km away from Earth (Ref 4), i.e. roughly one seventeenth its current distance. At this distance it would have appeared to be 17 times larger in diameter, or nearly 300 times bigger in area than it does now. It would have only taken nine hours to do a full orbit of the Earth. The Moon would have been so large in the sky so that it would have blotted out the Sun somewhere on Earth on every circuit. So there would have been a total eclipse somewhere in on Earth every nine hours. As we go hundred of millions of years into the future the frequencies of eclipses will become rarer as the Moon gradually appears to get smaller and smaller in the sky. In roughly a billion years time the Moon will be be so far away than even at its closest approach its apparent size will be be too small to cover the Sun. Total eclipses will then no longer be possible. 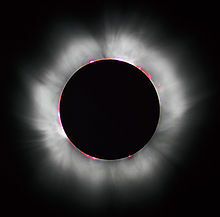 The two times in a year when a total eclipse can occur aren’t the same every year but change from year to year due to an astronomical effect called precession of the line of nodes. Great post! what a cosmic coincidence about the relative size of the moon to the sun, and the relative distance they have to earth. Thanks for the reminder! Hoping for a clear sky. The ‘total’ in 1999 was a disappointment as sky was overcast here. Thanks for the attention-jog. I don’t watch TV, so tend not to know in advance of these things. Being in East Anglia, I should get about 85% (which is probably better than I got for the non-event of the millennium.) We had a fantastic total lunar eclipse a few years back, Very dramatic colour effects. Thanks for checking out my moon poem! I used to be an amateur astronomy and made an 8inch reflector telescope, which alas, I no longer have!